The Vivitar ViviCam X025 is digital camera with 10.1 Megapixel and 4 x Digital Zoom. This digital camera support for MS Windows XP SP2 operating system and SDHC Memory Card. It has 2.4 Inch TFT LCD display. 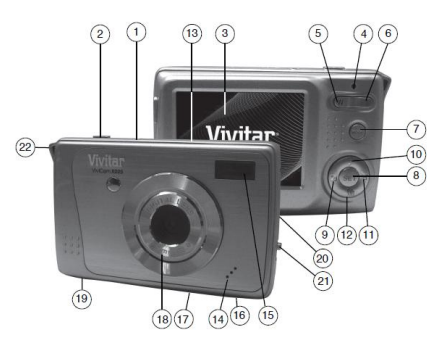 For owner of this camera, you can read and download the Vivitar ViviCam X025 Manual in pdf format. The manual very important because provide information like setting, installing, maintenance and troubleshooting guide. 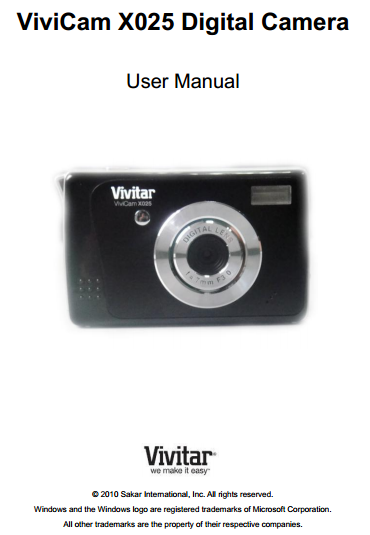 The Vivitar ViviCam X025 User Manual is available in english language. It's devided into 25 section. This manual provide detail reference information such as camera part overview on page 3, Installing the Batteries, Installing the Memory Card, Turning On the Camera, Using the Camera, Powering the Camera ON, Setting the Camera Language on page 5, Photo Capture Mode, Video Capture Mode, Image Resolution Menu, Set the Date and Time on page 24, Format Memory Card Menu on page 25, Photo Playback Mode Quick Function Buttons on page 28, Print Photos Menu, Protect/Lock Menu, warranty, troubleshooting on page 54 and more. I have taken photos and selected the “Get Images” button. I get a message that the images were successfully transferred but the photos do not appear on my computer. What do I do? I deleted images using the Vivitar Experience Image Manager. The images where also deleted from my computer. How do I recover images that I accidently deleted?